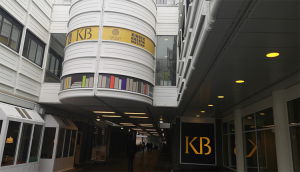 Last week, the OPF was kindly hosted by the Koninklijke Bibliotheek (KB) in The Hague for a busy 48 hours including our Board Meeting and JHOVE workshop. On 24th January, we met with the Board of Directors, who were able to guide and influence the Foundation’s upcoming activities and outputs. Our packed agenda for the day included discussions about the OPF workplan, our new release management process (including the scheduled releases for the OPF reference toolset), and exciting developments in our membership base and community engagement activities. 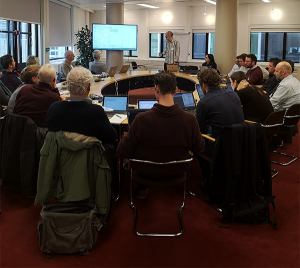 The following day, we held a ‘Getting Started with JHOVE’ workshop, led by OPF’s technical lead, Carl Wilson, and our Executive Director, Martin Wrigley. 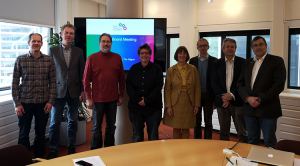 The workshop’s participants were invited to share a little bit about themselves and their work, and it was particularly enjoyable to get to know so many members of the digital preservation community from The Netherlands. 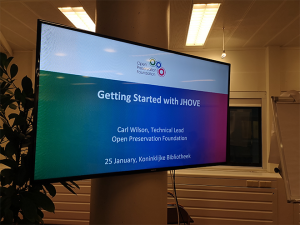 Many participants were new to JHOVE and to OPF, so the proceedings began with a brief introduction to both, before diving into the open source software. Carl talked about the importance of format identification, explaining that knowledge of file formats and properties provides the basis for preservation planning. The remainder of the workshop was an interactive demonstration of how to install and configure JHOVE, and how to interpret the results. Before the close, Carl explained how users can contribute to improving JHOVE – and you don’t need to be a developer to help. Participants were taken through the process of issue logging on GitHub, and were introduced to OPF’s process to triage these issues. Once the triage is complete, the issues and features are presented to the OPF Product Board to prioritise work for upcoming releases. Some participants had brought along their own files, and at the end of the workshop, they stayed behind to receive one-to-one help.